By any standards, this is an exceptional disc. The recording is stunning, with an immediacy and clarity which goes even beyond the usual standards of SACD. It is certainly one of the most vivid recordings I have heard on a commercial CD. It has informative and concise notes by Daniel Knaack. The programme itself, both intriguing and original, deals with political, religious and social issues which affected these three composers from three different generations. 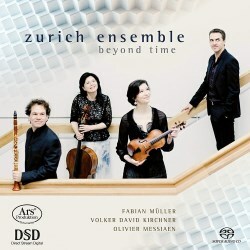 And the playing of the Zurich Ensemble, in this second CD release of theirs, is in a class of its own. It offers us a most perceptive and powerfully intense readings of Messiaen’s Quartet. It might do well to focus on the Messiaen first of all, since it is not only the one work which is most likely to draw people into this disc, but it is by far and away the most substantial in the programme. Its story is well known. Messiaen wrote it whilst a prisoner-of-war in Stalag VIII-A, Gurlitz, Silesia; he was obliged to devise it for the unusual combination of instruments because, as he recalled, “there were 30,000 men there and together they had four violins, one cello, a piano and a clarinet”. Its first performance in the prison camp on 15th January 1941 was heard by over 5000 inmates who listened with “rapt attention and comprehension”—and few performances fail to capture some sense of Messiaen’s original intention. It was to draw the listeners into a state of suspended time, and to present a vision of eternal beauty and peace to those held captive amidst the horrors of war. The Zurich Ensemble’s performance comes as near to achieving that as it is possible to do before an audience hearing this music in liberty and privacy. They evoke the ecstatic, the ethereal, the divine and the apocalyptic. They open up vast dynamic panoramas. Nowhere is it more vivid than in “Louange à l’Éternité de Jésus”. From Pi-Chin Chien’s tantalizingly poised first notes through to the movement’s dazzling climax, supported by Benjamin Engeli’s powerful repeated chords from, we have a seamless dynamic journey of awe-inspiring proportions. Each player reveals a level of intensity it is sometimes hard to comprehend. Fabio di Càsola traverses a world of colour, dynamic and spiritual imagery in “Abime des oiseaux”, one of the greatest solos in the clarinet repertory, and Kamilla Schatz seems to waft beyond all human reach as she drifts off into ecstatic, stratospheric heights in the closing bars of “Louange à l’Immortalité de Jésus”. The other works on the disc have a certain affinity with the Messiaen, although neither has been written under quite such trying or testing circumstances. Volker Kirchner employs identical instrumental forces as he examines the question of isolation as a consequence of emigration. It is an issue rather more pertinent today than it was when the work was first performed in Stuttgart in 1995. There is menace (the opening piano figure is horribly redolent of John Williams’s Jaws music) and extreme tension in the first movement. But the overriding impression this particularly vividly delivered performance gives us is of chaos and confusion, the ensemble often splintering off in wholly different directions. The second movement, in its evocation of the Blues, pays homage to the musical legacy of those exiled by the slave trade - revealing di Càsola to be a supreme master of clarinet flexibility - while there is a haunting remoteness in the third movement. There is a tangible sense of loneliness which Pi-Chin Chien brings to the start of the infinitely sad fifth movement. The work ends with a frantic burst of nervous energy which reveals remarkable gifts of coordination and individual virtuosity from all four players of this highly impressive ensemble. Fabian Müller sets three German-language texts by Tim Krohn drawn from aboriginal legends about the creation of the world (hence the work’s somewhat clumsy title). We are told they are humorous, but since neither texts nor translations are included, we have to take that on trust. The work is a veritable tour-de-force for Christiane Boesiger. She wonderfully combines the roles of raconteur, character actor and fully-fledged soprano singer, in what is a magnificent display of vocal versatility. The infinitely detailed accompaniment from the ensemble adds enticing touches of colour, but I wonder whether this might not have been more effective in its original 2010 manifestation, scored for soprano with strings and harpsichord, underlining the essential brittleness of Müller’s economical writing.